Jaimi and I continue to research Honeymoon options. Maybe Hawaii. Perhaps somewhere in the Caribbean. We head Belize is nice. But then again, Delaware has beaches too. We want relaxation, beautiful scenery, a broad range of available activities, warm weather – all at a reasonable price. And so we’ve been spending a decent amount of time on websites like Trip Advisor and Fodor’s, looking for recommendations. But even the most highly rated resorts and vacation destinations receive a smattering of bad reviews now and again. If you take all of these seriously, then you might think twice about staying just about anywhere. For example, the Sheraton in Maui has something like 650 reviews – almost all of them overwhelmingly positive. Apparently, though, all is not perfect. One lady complained about the weather being cold, and locking herself out of her room – obviously, both the fault of the hotel. The Four Seasons, on the other hand, has a weather machine (set to 82 degrees and sunny), and biometric locks – fingerprint scan, retinal scan, voice recognition etc. Or upgrade to a suite, and you get a local mute boy to carry your keys around for you. So even if you lose your eyes, voice, and fingers, you’ll still be able to get into your room. 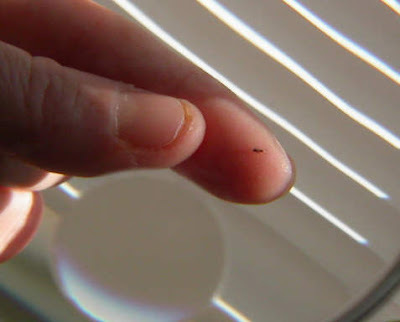 Another traveler complained of a bug in the room, and even snapped a photo of the tiny intruder. By God! A bug found in a room that’s not hermetically sealed, and in the middle of a tropical rainforest?!?! How dare they!! That resort sounds DISGUSTING. Yes, of course I’m being facetious. And even though the negative reviews may have some merit, I’d bet that these reviewers find something to complain about anywhere and everywhere they go. Look at the terrible, gross, scary bug we found in the doorway near the jungle!!! This place is disgusting!!!! We'll never stay here again!!! So as you can see, we have to sift through all the crap reviews and try to figure out which ones are valid. It’s a real nightmare. Maybe we’ll just go to Delaware. I am from the Delaware Department of Tourism (DDT). I really enjoyed your recent blog post, but found the shots at my great state very offensive. Have you have heard of Dogfish Head Beer? Guess what hotshot - its from Delaware. No where else. Do you like to shop for clothes and pay less? Delaware has TAX FREE shopping every day of the year. Delaware also offers the number one rated shoreline in the mid atlantic region of the United States. Come to Broadkill Beach and I dare you not to have a fun time. Look it up, all are true. For more information please check our website at http://www.visitdelaware.com/. Warmest wishes in the planning of your wedding. You are the first state, and apparently, the most emotionally fragile. Of course I love Dogfish Head beer AND tax-free shopping. They are two of my favorite things in the whole wide world. Delaware is tiny, but full of surprises and wonder. I get it. It's just that I'm from Philadelphia, and going on a Honeymoon to Delaware would be sorta like marrying your sister - it just won't do, and leaves everyone involved confused and ashamed. If I had made fun of New Jersey, would that have made you feel better?